I’ve been attempting to figure out how the hell to post this delicious but not super crazy concoction on the blog for a bit of time now, but finally the perfect event came my way and all is good. Fun and Food is hosting this months Monthly Mingle, an event started by What’s For Lunch Honey? and one I was not familiar with until recently. Not only did the event call for an appetizer recipe, but for a vegetarian appetizer recipe. SHA-WEET. This appetizer was concocted by me because, well, I was freaking hungry and needed some crunch at that moment. I had leftover mango salsa that we had made for a previous meal and a green plantain that had to be used. I thought about those bags of plantain chips that are sold in the many bodegas here in NYC. They could be used in lieu of potato chips or anything else that could be used with dip. 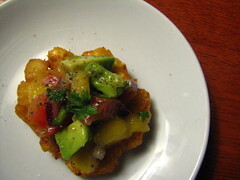 Why not make some tostones (fried green plantains) and use them as a cracker? So that’s what I did. I figure if I’m having more than a party for one (me), these could be a cheap and delicious alternative to the old boring chips and salsa. Mix all the ingredients for the salsa together and allow to marinate for at least a half hour. If you are going to top your tostones with a bit of the salsa, only serve immediately after topping them – you don’t want to make them soggy! Otherwise, put tostones out for guests to dip into the salsa themselves. How yummy is that? It looks perfect the summa-time entertaining circuit. Looks delicious. I’ve never tried cooking with plantains, but I do love tostones. This looks like the perfect accompaniment to sitting outside in summer, cold drink in hand. 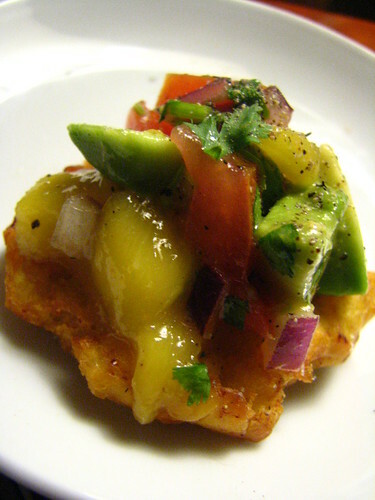 Oh what a great idea to use tostones with that delicious looking mango salsa. It all sounds so tropical. It makes me wanna go to the beach. Great entry! I love mango salsa. LOVE LOVE LOVE it. Have I mentioned how much I love mango salsa? Very clever and appropriate to serve with the plaintain chips. When I clicked to the tostones recipes I also loved your jerk recipe. I’m thinking this may be the appetizer at my next dinner party. It seems great minds think alike since I just recently did a jerk pork with a mango slaw and I have a recipe in the MM too. I love that shinny texture the picture shows. Magnifically builded :D. I have to clon that Mango salsa of yours :D… only the mango salsa? NOpe… the whole thing will be much better!!! What don’t I love about this recipe? Yikes! And I just bought two plantains this morning, because, really, who can buy just one? There is no concept of a bodega here in Atlanta. I miss jogging down to the corner and picking up a bean pie and a quart of chocolate milk when I had the munchies. Oh that was many, many moons ago! I stole the mango salsa recipe. It has been done and done and even I have one. But now…I have yours!!!!! Wow, I used plantain last night for a meal, too. Must be something in the air! That salsa looks fantastic. I love those chunks of red onion and avocado. WOW! I’m totally shocked! I didn’t expect anyone to comment on these! Thanks so much for the comments! I guess the colors pop and, well, bright colors make people happy, right? Mmmmm… so tasty-sounding and so PRETTY! Wonderful! I get these very small Mexican mangoes at Costco very occasionally, and they are terrific in salsa. Just a different, richer flavor! Look for them! I love the idea of this appetizer and that photo looks awesome. This is my kind of appetizer…I’d have this is one hand and some tequilla-heavy drink in the other. Ola Ziza! Cumprimentos de Brooklyn! agradecimentos para sua visita e voltado logo! Holy god that looks sinful. I absolutely love tostones more than most things. I conveniently work in a part of Brooklyn with many restaurants and shops that make delicious tostones. This is such an interesting twist though. I love the idea of mango on top. ATTEMPT! Tha t was s success!I love plaintains. so Cuban!!! check ur bloodline.